INDUSTRY.co.id - Jakarta - Vivo V9 Super Selling Day started from April 5, 2018 which was held simultaneously in 14.000 vivo outlets with 16.000 promoters spread all over Indonesia. Previously, vivo successfully held pre-order in official e-commerce for six days. In that period vivo V9 managed to become android smartphone with sales number 1, in the HP Android category with the price range of 3-4 million smartphones on several E-commerce platforms Lazada.co.id, JD.id, Shopee and Akulaku. Following the success of pre-orders, based on monitoring at the mobile phone sales center in Jakarta, Mall Ambassador, South Jakarta, the official Vivo V9 Super Selling Day started Vivo began to show a high public interest in Vivo V9. Edy Kusuma, General Manager for Brand & Activation Vivo Indonesia said the success of vivo sales is not separated from the support of consumers as well as e-commerce partners and promoters who actively introduce vivo V9 closer to the community. 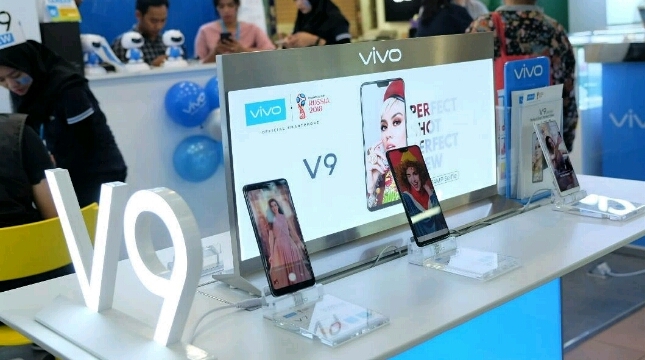 In some official stores Vivo outside Jakarta also seen consumers crowded the showroom Vivo product sales because interested vivo program V9 Super Selling Day. "We start with the word thank you, because this morning we get good news from the promoter’s friends in various regions, that the enthusiasm of the people of Indonesia to the presence of vivo V9 is quite high," said Edy. Seeing the positive response, Vivo Smartphone began to prepare additional lines to produce Vivo V9 to meet the existing demand. For now, the highest consumer demand is for the Black V9 unit. Comes with a price of Rp 3.999.000, vivo V9 is much in demand because it has a technological innovation of 6.3 "FHD + FullViewTM Display which is the highest ratio in the world, stylish design equipped with Funtouch OS 4.0 supported by the Android operating system Oreo 8.1. Coupled with AI Selfie Camera 24MP technology and Dual Rear Camera - AI Bokeh that can make users can enjoy the images with quality DSLR. During Super Selling Day, vivo offers attractive offers to gadget lovers. The buyers will get a Promo in the form of direct prizes and special data packages from official mobile partners such as Telkomsel, Indosat, and XL.